A potentially inspired piece of Brendan Rodgers transfer business loosely justifies amplifying a ‘fear not’ message amidst the Virgil van Dijk calamity. That said, it seems impossible to admire without also reflecting on yet another gutting and exhausting transfer setback. The current plague of humiliation, embarrassment and anger amongst Reds seemingly stems from the incompetence of the club perhaps more so than a deal for the Southampton defender supposedly collapsing. An admirable attempt by supporters to unveil even the slightest positives has identified an inexcusable mistake of this calibre as a lesson fittingly hogging the spotlight. FSG will seek answers from sporting director Michael Edwards, new CEO Peter Moore finds himself with the opportunity to make an immediate and necessarily ruthless impact and Jurgen Klopp will be forced to reassess his transfer plans. For the club to so sloppily ruin the chance to sign a high-profile and in-demand Premier League star, notably keen on a move to Anfield, reaffirms a serious issue that must be rectified once and for all. It’s time questions are answered and a fresh approach is orchestrated, for the sake of Liverpool’s future. Understandably well-disguised doubts over Van Dijk’s hefty price-tag have since functioned as an attempt to hide an overwhelming disappointment. In truth, it will take some rethinking for Liverpool to make amends for failing to sign their priority target and a man prepared to reject both Chelsea and Manchester City in favour of working with Klopp. Back to Rodgers, though, and that signing many remain quietly confident could develop into a defender of similar traits and of a similar mould to the £70m Van Dijk himself. Part of responding is not only fulfilling the need for a productive transfer window, but also proving the squad Klopp currently has at his disposal can progress and play a leading role in helping Liverpool rise as consistent Premier League title contenders. That means taking the club’s youth stars as far as their talent and work ethic allows them and forcing improvement from each and every member of the team. In a way, they should be working with the belief that there are no new signings arriving. 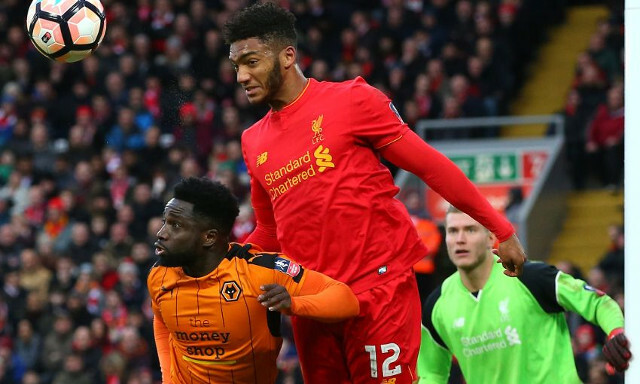 While the Reds have been pursuing a new centre-back, Joe Gomez will have been watching and working hard behind the scenes knowing full well Klopp will be prepared to keep his defensive options open next season. The present need for a polished and proven defender, a Van Dijk if you will, is undeniable as Klopp strives to build a team that can start challenging both domestically and in the Champions League not in three years, but now. Gomez isn’t a certified option for now but that’s only down to the fact he hasn’t had the chance to prove it. A long-term injury disrupted what deserves to be remembered as a bright and admittedly eye-opening start to life at Liverpool. Few expected him to slot straight in at left-back and look as composed and accomplished as he did following his move from Charlton back in 2015. Claims he was ‘one for the future’ were somewhat deterred by performances that suggested he was well ahead of schedule in that respect. Regardless of his lack of game time over the past two years, the foundations of all the required technical and physical attributes are there to make him a key aspect of Klopp’s long-term project. Time is on his side, the ideal manager is at the helm and the ability is there for him to go on and become what Van Dijk is now. That powerful and level-headed ball playing central-defender with the pace and athleticism becoming so increasingly important in England’s top flight. Next season’s cup competitions beckon as initial opportunities for the 20-year-old to remind fans of what a worthy contender he is. The tough and gruelling period he has endured on the side-lines threatens to trigger a fresh determination, the kind expected from a new signing fighting for a place, well aware he has the backing of his manager. Klopp’s faith in the youngster doesn’t rule out the possibility of loan move in aid of playing regular first team football. To let him leave permanently would be a foolish mistake at a time where the club is already under pressure, but to find him a temporary home in the Premier League could take him a step closer to being that ‘inspired signing’. The slight fear that accompanies such a move is just how few loanees in fact return to make a name for themselves at Liverpool. A fully-fit Gomez gives Klopp a viable option even before new faces are brought in. He isn’t a Van Dijk yet but he is worth considering as a prospect capable of being a starter sooner than many will have expected. Seeing Joel Matip prove to be an influence in Dejan Lovren’s Liverpool revival has somewhat teased supporters into wondering just how useful a mentor he could be to Gomez as well. It’s a partnership many are keen to see and one Klopp will find difficult to resist fielding at some stage over the next year.